Shimmering views of the Pacific and luxurious amenities abound at the oceanfront Hyatt Regency Huntington Beach Resort & Spa. Innovative, Spanish-inspired architecture sets the scene for a memorable retreat at this resort, complete with pampering spa treatments, irresistible restaurants, ocean adventures and attentive service. 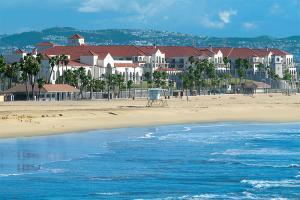 This Huntington Beach hotel features 517 elegant, spacious guestrooms with private balconies and deluxe amenities.